The Supreme Court verdict that women, of all age group, can enter Sabarimala temple in Kerala, is a thrash to Hindu traditions and practices, a danger to Hindu culture. That menstruating women should not visit the shrine has been a tradition born from the belief that the Ayappa deity is a ‘naishtika brahmachari’ (eternal celibate). Entry of women above the age of 10 and below the age of 50 has been prohibited. The ancient shrine of Ayappa at Sabarimala is one of the largest annual pilgrimages in the world with an estimated 45–50 million devotees visiting every year. It is located at Perunad on a hilltop amidst 18 hills in the Western Ghats. The temple is open for worship only during certain days of the year – Makar Sankrant, Maha Vishuva Sankranti, 1st five days of each Kolliavarsham, and during Mandalapooja (November-December). Sabarimala devotees wear black or blue dress and keep a fast for 41 days. 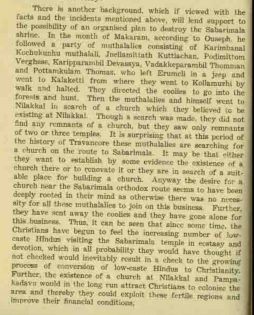 Do you know Sabarimala Temple was the target of Christian missionaries? 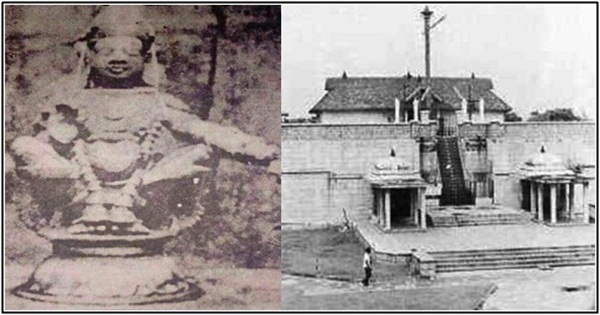 In 1950 there was an attempt by Christians to destroy the temple. This first attack on Sabarimala has been forgotten. 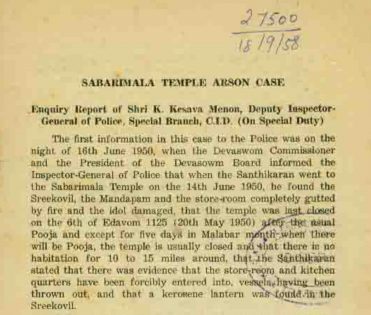 Here is the Enquiry Report of Shri K. Kesava Menon, Deputy Inspector- General of Police, Special Branch, OLD (On Special Duty) on the Sabarimala temple arson case (put as it is in parts). 1. 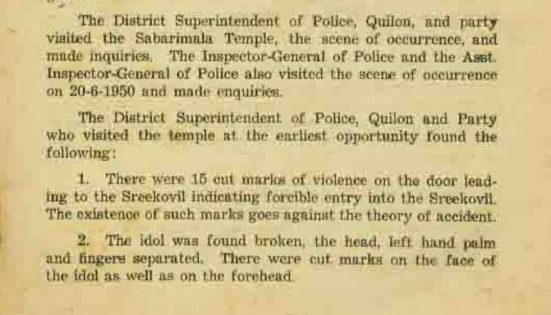 There were 15 cut marks of violence on the door leading to the Sreekovil indicating forcible entry into the Sreekovil. The existence of such marks goes against the theory of accident. ‘…Exhaustive and thorough inquiries were made and as a result the movements and activities of the following parties were brought to light. 1. Ouseph Thomman alias Vattakunnel Kunhupappan and his party. Featured image courtesy: Sadhananda Swamigal and hindutemplesguide.com. 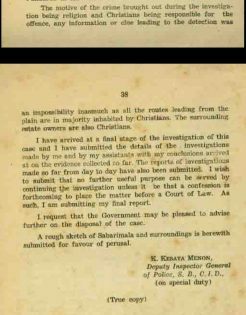 Courtesy: Enquiry Report of Shri K. Kesava Menon, Deputy Inspector- General of Police, Special Branch, OLD (On Special Duty) on the Sabarimala temple arson case (put as it is in parts).